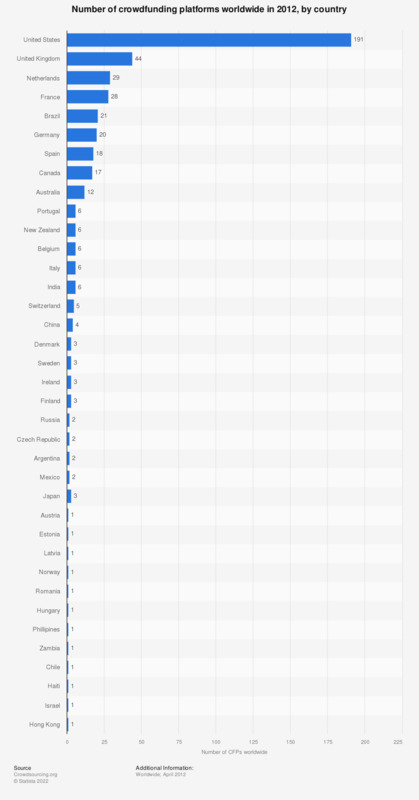 The statistic shows the number of crowdfunding platforms worldwide in 2012, by country. In that year, the majority of crowdfunding platforms were based in the United States and Europe. In 2012, there were 191 crowdfunding platforms in the United States. Crowdfunding or crowd financing has its roots in the American website ArtistShare, which was founded in the early 2000s. The idea and concept of crowd-sourced fundraising – the collective effort of individuals to pool together money online to support the efforts of individuals or organizations’ - had already proved itself to be a worthwhile idea. It was not unheard of prior to this that music fans would pool together money in order to support bands and musicians on their tours. After the initial pioneering stage of ArtistShare other platforms began to appear and the crowdfunding sector started to show strong signs of growth, in the United States initially and then in Europe. The direction of growth is cementing itself with each year that passes; growth in the number of crowdfunding platforms in 2012 was up 60 percent in 2011, a stark rise in the number of platforms has resulted in an increased funding volume, 2.8 billion U.S. dollars in 2012. Crowdfunding has been able to provide a means of access to funding for some enthusiastic entrepreneurs’ whose ideas have pleased the crowd. In the age of austerity and financial uncertainty, some see the role of such funding organizations as positive. Many banks in a number of countries are reluctant to make capital loans to small businesses, sparking accusations among some that lenders are failing to lend their support to a key potential area of economic growth. While the motivation behind the donations made is often unclear, it is a positive sign that people are willing to donate money to worth while causes in which they see a degree of merit. CFPs stands for crowdfunding platforms. Estimates are based on historical market projections and do not take into account extraordinary events (e.g. passing of U.S. Crowdfunding legislation) which are, based on available data.